Hey, I’m Michelle. I’m gathering up Mums who crave more sunshine in their lives, and are totally into the outdoors. Come along for the ride! We’re more inspired outside, right? I hope this blog helps you find even more reasons to get out into the wild blue yonder. When I’m not writing or working, I can be found trail running, getting immersed in something watery, baby-wearing, or tickling my four year old. Often, there’s wine. 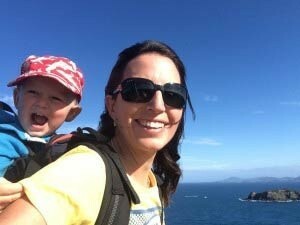 I’ve sailed many places in the world, but these days my heart is anchored here at home in New Zealand with my husband Brenton, little boys Nate and Tasman, and mad dog Scout. This place is PARADISE. If you haven’t been, please come visit! And if you live here too, can you believe your luck?! 6) For a while there when I was a toddler, I would only pee on grass. Yup. That was a challenge for my parents at 35,000 feet when we had to fly across the world. Guess I was born outdoorsy. Join our energetic new Facebook group, The Outdoorsy Mama for awesome tips, ideas, and inspo from other outdoorsy mamas just like you! You can find us here.